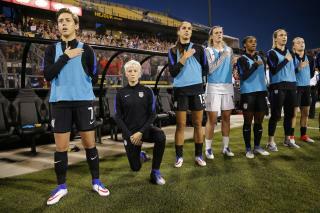 (Newser) – Megan Rapinoe knelt during the national anthem before a US women's national team match against Thailand on Thursday night, the AP reports. Rapinoe first knelt during the anthem Sept. 4 before a game with her National Women's Soccer League team, the Seattle Reign. Rapinoe, a devoted advocate for LGBT rights, said she wanted to express solidarity with San Francisco 49er Colin Kaepernick. After Thursday's game in Columbus, Ohio—which the US won 9-0—US Soccer issued a statement to ESPN that said representing the country is a "privilege and honor" for any player or coach associated with the national team. why is it OK to take the money (all of which has white guys on it, some of them slave owners) but its not ok to stand for the Anthem? If they were serious about their protest they would not accept American money but somehow they do not have a Problem spending those Jeffersons. Misguided and ignorant. FYI, blacks are among the most anti-homosexual people in America. Thankfully, it was the black preachers who stood against homosexual marriage in my state. When this homosexual woman says she's standing in solidarity with a black man and other 'oppressed' people, she is clueless. The black people would oppress her more, with good reason. who really gives two shakes of a lambs tail what these spoiled overpaid brat athletes do? want to make it go away.... stop making it a story. good effing lord - probably 10 people even knew usa womens soccer had a game - and maybe 1 of those cared what this woman did. next week... don't print a story about whether colin (i was raised by whites and am overpaid to play a game) capernick stands kneels or does situps during the anthem. and guess what ... if it does not give the attention wh**e the attention he wants... his protest will fade to oblivion.